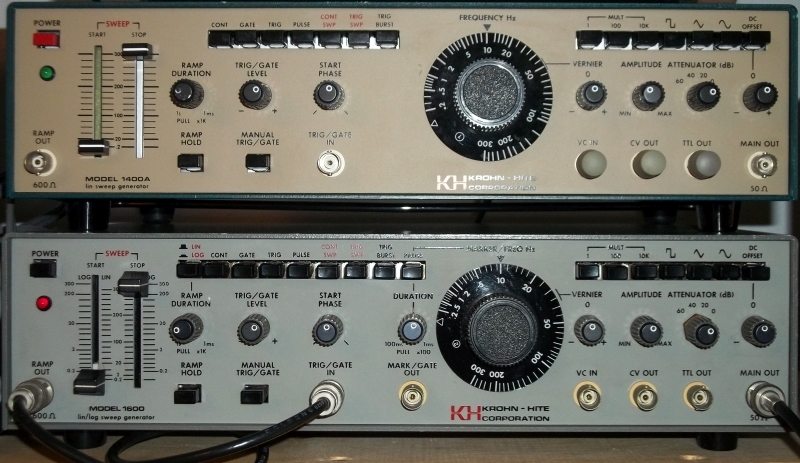 Over the years I've collected a lot of Function and Signal Generators from HP, Krohn-Hite, Wavetek and Heathkit. Before that, being too poor as a kid to buy them, I played with the Intersil 8038 and Exar 2006 function generator ICs. I wound up collecting a lot of schematics of Signal and Function Generators that I will be posting here. One of my all-time favorite function generators was the Krohn-Hite 1600 with log sweep. Though I don't own a Krohn-Hite 1600 I do have fond memories of using one at MicMix and a couple of years ago scored a Krohn-Hite 1400 on eBay. The '1400 doesn't have log sweep but that's not something I use anyway. One of the unique and cool things about the 1400 and 1600 were that they used slide pots to set the start and stop sweep frequencies. I do have a schematic of the Krohn-Hite 1600 which may be useful to those that own one. For the rest of us, the schematics serve as a look into the analog past and some clever and good circuit design of basic analog building blocks. Now I do own a Krohn-Hite 1600 along with the Krohn-Hite 1400. I got this one on eBay at a very reasonable price. With a little contact cleaner and a couple of power supply electrolytics it runs just fine. The Leader LFG1300 was a simple and easy-to-use function generator featuring both lin/log sweep and AM modulation. Interesting how Leader calls the sine shaper a "tangent equalization circuit." 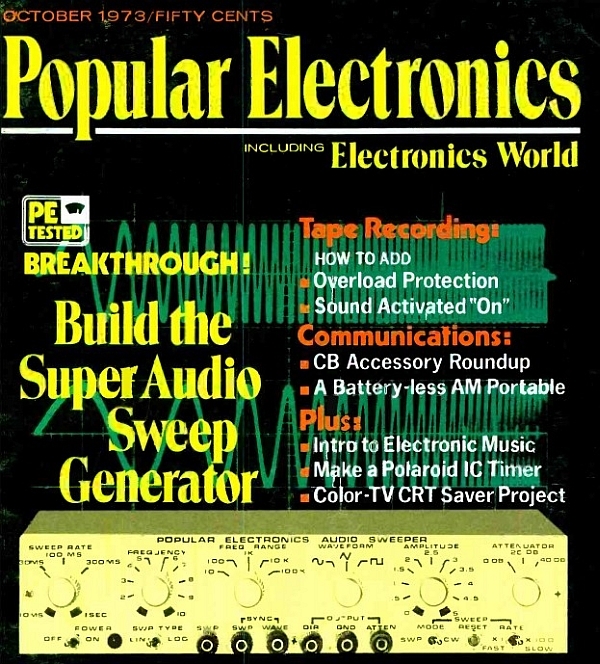 I saw the Popular Electronics October 1973 issue as a kid and knew there would be a function/audio sweep generator in my future. It used the Intersil 8038 function generator IC. Though I toyed with the ICL8038, my first function generator was actually a Wavetek 185. I got lucky and picked it up for $50 from a KA Electronics customer selling one. I still have the Wavetek, it works, and is the only one I have that reaches 5 MHz. 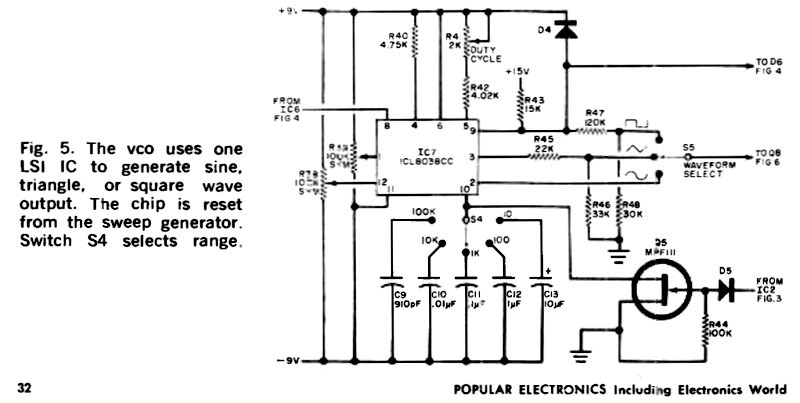 Super Audio Sweep Generator, VCO Schematic, Popular Electronics, October 1973, Figure 5.